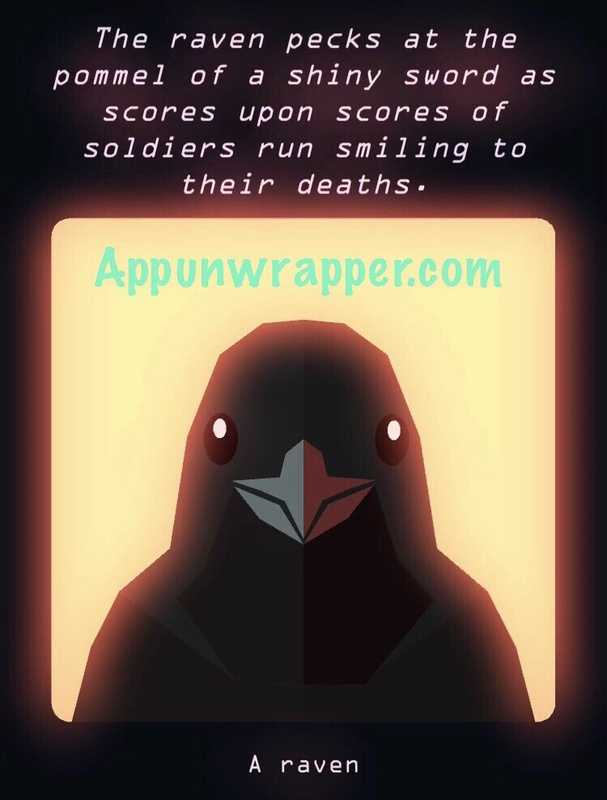 Raven clue: The raven pecks at the pommel of a shiny sword as scores upon scores of soldiers run smiling to their deaths. Play until Tyrion (your Hand) appears and tells you they’ve captured Cersei. Summon her to trial and a short time later, Varys, your Master of Whisperers will appear and say the trial is ready to start. Commence with the trial and sentence Cersei to death (cut her card in half). Eventually, Varys will show up again and tell you that the people believe you to be The Lightbringer, or Azor Ahai reborn. They believe you were sent by the Lord of Light to save them from the White Walkers. You’ll then get The Sword status effect. Now, wait for Winter and then die. You’ll have to give a speech (be careful with your choices if any of your factions are close to min or max!). 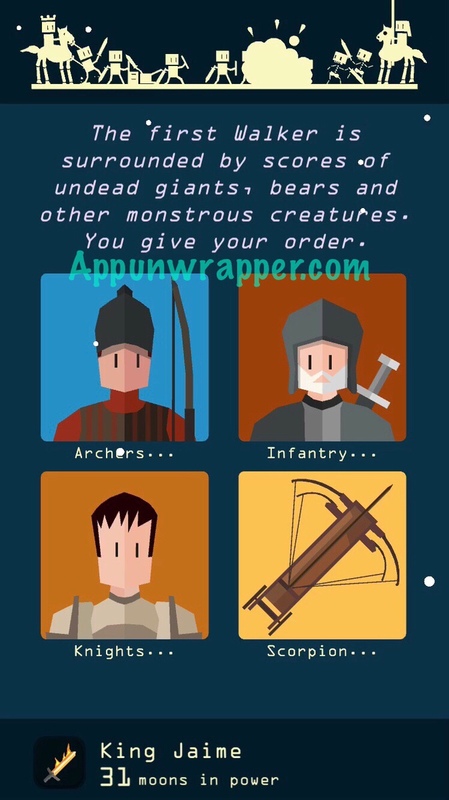 – First wave, against undead giants, bears and other monstrous creatures — Use your Archers. Press on. – Second wave, against the raising of your own dead soldiers — Use your Knights. Press on. – Third wave, against the blue-eyed Viserion (dragon) — Use the Scorpion (Dragon killer). Press on. Now you should win the battle. You can even make a mistake, as long as you get two of them right, I believe. Using the Scorpion at the right time is very important. Once again, you’ll defeat the White Walkers and summer will arrive. 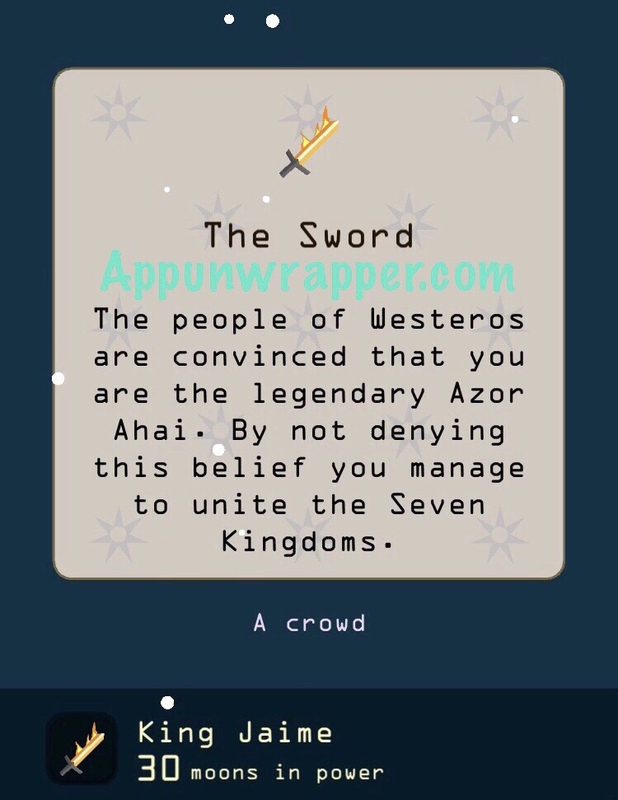 Click on the character you need below or click here to continue to Tyrion’s ending. In my game ,there are only 15 options on the last level of ”the game” 3 rows of 4 and 1 row of 3.Also,arya tells me that i found a dead crow when i tap the one 2down and 3 across.What to do? That’s strange. I don’t know if something changed in an update. I’d like to add that the only “proper” way to die in Winter is by going low on any resource. Going high will cause common death, not leading to the battle with Walkers. Play as Gendry until you get that anonymous raven message – “lets play another game”. In any game after that you’ll have 16 cards. I included photos from my game, but If it’s different each game or they changed it since, I have no idea. I thought it was an odd puzzle to begin with. I only had the answers because I had recorded my playthrough. After killing cercei with Jaime doesn’t compare varys and i can’t obtain THE SWORD. Can you publish a video of the game? I already made a video. It’s included in the post. When playing for Cersei, you MUST choose to have a demonstration. Without it, I didn’t get War Machines (twice). It should work with any death in winter. Could be a bug? Jon Snow is probably the hardest to play. If I graduated in Arya’s game, she doesn’t thrust me, and I can’t get the horn. Also if I got the message in the same reign.. help?